Renninger's Antique and Collector's Extravaganza are held every April, June, & September on the last full Thursday, Friday, & Saturday of the month. 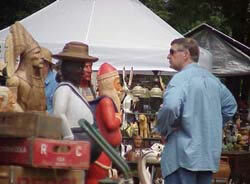 The show grounds are behind Renninger's Antique & Farmer's Market in Kutztown, PA. Many exhibitors set up shop outdoors, under tents, and in the two large pavilions. The pavilions are 60 feet wide by 350 feet long. The Indoor Antique Market and the Indoor Farmer's Market are also open during the Extravaganza. You will find the Extravaganza a truly unique experience. For more information about being a dealer at the Extravaganza, view or download the Extravaganza form (PDF Format) or contact us. spaces. Many of the dealers are meeting customers for whom they have made special purchases. Unlike internet selling, customers will get to touch and closely examine merchandise they are interested in purchasing. Although customers have been in mind for certain merchandise dealers will sell to anyone. You are encouraged to ask questions and learn about the merchandise. Most antique dealers have a passion for what they are selling. Although you may see many people rushing about from dealer to dealer you may consider taking your time. So much is missed in the rush. If you are looking for specifics, by all means, ask. Most exhibitors have merchandise in many other locations and cannot carry all their items with them. Also, many dealers may have different merchandise for different shows. Don't underestimate the vast network of antique dealers. They are not opposed to referring you to someone else. The hours for Friday and Saturday are 8 AM to 4 PM both days. Don't worry about missing everything by not shopping Thursday. Many dealers don't even put some of their items out until Friday. Saturday morning usually starts with an addition of 100 to 200 new exhibitors, replacing some that have moved on. Each day is a different and unique experience. Dress for all weather. The show runs rain or shine. Pack a bag so you can shed or put clothing on. And above all, wear comfortable shoes. You will be doing a lot of walking. Sign up for our mailing list to get special deals, news, and info about special events.